Weeks before my classes started, I was a bit enthralled and at the same time apprehensive. The thought of me starting in an Open University gave me mixed emotions but then it ignited a fire in me. There was a glimmer of hope – a hope that I have been clinging on since I started my UP education in Diliman campus. There was actually a light at the end of the tunnel – a light that has been guiding in the pursuit of greater things. There was a wave of tenacity – a wave that keeps me push through my limits yet grounded on my principles. Why I transferred to UPOU then? The first reason would be convenience and less (external) pressures. Yes, pressure. We all deal pressure most of the day, aren’t we? And based on the articles or personal experiences I have read, being in a distance education will probably exempt you from the pressures brought by traditional education. I must say, in its general sense, I was the most curious about being a student at an Open University. To feed my curiosity, I actually even read academic articles of how it feels like being an online student. It gave me a whole new level of understanding and enlightenment. It was a Eureka! moment. And in that time, I have felt so much enthusiasm and confidence in this new journey I am about to embark to. I actually couldn’t think straight on what I would do which I thought it’s a good sign after all. I explored it and taught myself to familiarize it. At first, you get lost. You will have a lot of questions running through your mind. I was even comparing it to the UP Diliman website which I was used to navigating. I familiarized myself even more about the program, the Bachelor of Arts in Multimedia Studies, so-called as BAMS. Here I was able to grasp deeper about the courses I will be taking up for the next trimesters. It made me excited! The new curriculum is interesting. I knew in myself that I have to be organized and efficient every week. I knew that being a distance education learner requires you to have good time management, that will require yourself as your competitor most of the time. But I knew also that it’s going to be fun! In addition to that, because I am quite OC, I made a folder solely for the 1st trimester. So that’s it. What I want to instill to the one reading this is you should do and follow an organized way of doing requirements later on. This will keep you on track and at the same time, it shall keep you motivated. Finally, I received my admission notice from the Office of the University Registrar. Also, after a few days, an email from the Faculty’s Secretary from which was informed the courses that we can take for the 1st trimester. Aside from that, an attached copy of the new BAMS curriculum and a curriculum checklist. UPOU starters, isn’t it? Eventually, registration, enlistment of courses started. For this, I had to use the StudentPortal site where we can enlist, enroll online, the transaction for the request of ID, books to order, other documents request and the like. This is equivalent to the CRS (Computerized System Registration) of the Diliman campus. So there, once enrolled I was able to put to life the course accomplishment tracker I created in Excel. I fixed also the folder and created sub-folders per each course such as Wika 1, Comm Skills 2, MMS 100, and MMS 101. Oops! I just need to clarify that I was able to take MMS 101 with the secretary’s approval since there is no other course I can enlist to fulfill the normal academic load which is 12 units. Some courses in UPOU are seasonal. But the Secretary, Ma’am Joyce, reiterated that MMS 100 should be taken first as a prerequisite to other MMS courses. It is just a case to case basis especially if you have GEs from other UP units which can be credited to the curriculum. Take note of that! August 25th. Start of classes. Start of Distance Learning Education. Another site was introduced to us, this is the MyPortal site. This is where all the learning, interactions, discussions, and uploading of Study Guide/Course Modules happen. At first, I got intimidated by this website. I was quite really unsure how this works. And few days after the 25th, there’s no still uploaded document so I was a bit nervous. Good thing our batch has a Facebook group chat. So what I did was to ask whether they are experiencing the same thing. And many agreed. After almost a week, all the modules and related documents were uploaded by our professors. Again, I thought it would be easy but it wasn’t. I did not know where to start. So I calmed myself. I needed to be organized and one important thing that I and you should always bear in mind is to do it one at a time. Print all the necessary files you think can help you and makes your life easier such as the Study Guides per course. Since reading materials linked articles are uploaded weekly in accordance with the Study Guide given by the professor, I find it helpful and convenient to choose which reading materials to print. 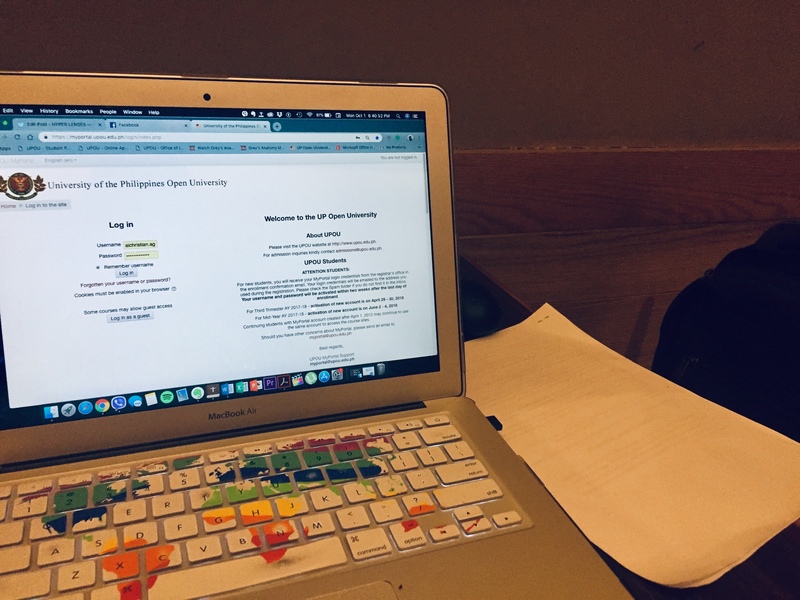 For a person like me who is not used to reading longer hours in front of the laptop, I need to print some materials so I can study very well. Modules uploaded by the professors are copyrighted. You cannot print those because these are password-protected. You cannot even copy-paste it to another word file. It doesn’t work that way. So here’s a piece of advice. When you are reading Modules, note-taking is an essential way to learn or to study. I take down notes or make a summarize to another file while reading the module. Once you’re done with the Module you are reading, if there is a need to print so you can review it again, you may print that notes. For every week, I allot three to four times a day to study out. I admit, I really can’t take up the idea of studying or staying at home to study. It doesn’t make productive and efficient. In my case, Tues-Wed-Thurs-Sat is my schedule to study outside such as in coffee shops nearby. And whenever I am at home, I make sure to check MyPortal from time to time, also my course accomplishment tracker. I have to make sure also that I allot ample time for each course when it comes to studying/reading the modules. In taking Quizzes, I was, at first, nervous to open the Quiz section. In fact, it takes me more than 10 minutes in front of that section asking myself whether to take the quiz or just take it on another day. My advice, again, make sure to fully understand the Modules you are reading. No shortcut. No cheating. You can learn the course by reading everything! So do not resort to patch reading. Or just scanning. Exercise yourself to be drowned with dozens of reading for each course. You will get used to it eventually as UP wants to inculcate in your academic excellence and independence. If ever you get lazy or unmotivated, taking a break for a day without facing learning stuff online would really help and gain back your sanity. I swear. You can do the normal things you usually ought to do. Learn to ask questions. When you feel like you don’t totally understand something, message your professor or post a question in your course forum. In this way, you will avoid guessing game. This is one way also to exercise and participate in any discussion forum. You will also learn from your online classmates about their thoughts about the subject matter. Lastly, always remember to have fun while learning. You are the manager of your own time. It’s really all up to you! I think that’s all for now. Thank you for reading and I hope you learn something from my UPOU experience so far. I’ll update you again very soon folks.